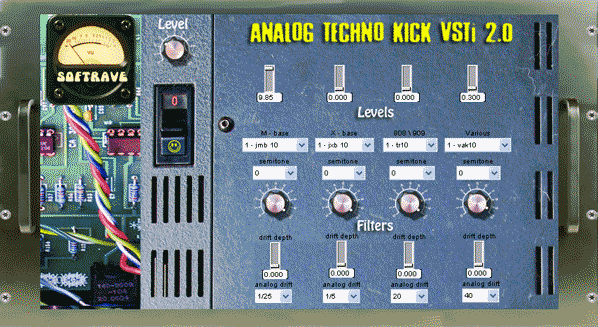 (This plugin now has more powerful SUPERKICK brother Analog techno Kick Pro. This virtual instrument has 238 phat techno kicks sampled from pure analog drum machines. M bank contains samples of kicks Jomox M base, X bank contains sounds of Jomox X base box, Tr bank contains you guess, analog kicks from famous legendary Roland TR 808/909 series and VAR bank contains samples from different analog rare and exotic drum boxes from many many developers. You have possibility to filter high frequency of any bank and to mix sounds together to create Jomox & Roland Kick for example. The idea was to put all analog sounds together to save time for creativity and to have easy access the best selection of real analog kicks, essential for techno production.